1.Pat the scallops dry with paper towels. Season on both sides with salt and pepper. 2.Coat the bottom of a large sauté pan with oil and heat over medium-high heat until the oil shimmers and just starts to smoke. Working in batches, add the scallops and sear on each side until golden brown, about 2 minutes per side (depending on the size of the scallops). 3.While scallops are cooking, in small saucepan, combine the lemon juice, orange juice, wine, shallot, and bring to a simmer. 4.Cook until the liquid is reduced by ¾ of the way. Reduce heat to low and, using a whisk, add in 1 piece of butter at a time until fully incorporated. Season with salt and pepper. Add a touch of water if sauce becomes too thick. 5.For the salsa verde, combine parsley, basil, mint, scallions, capers, vinegar, and garlic in a good processor. Turn on a stream in olive oil until a paste just starts to form. Turn off and adjust seasoning. Salsa should hold together, but not too thick. 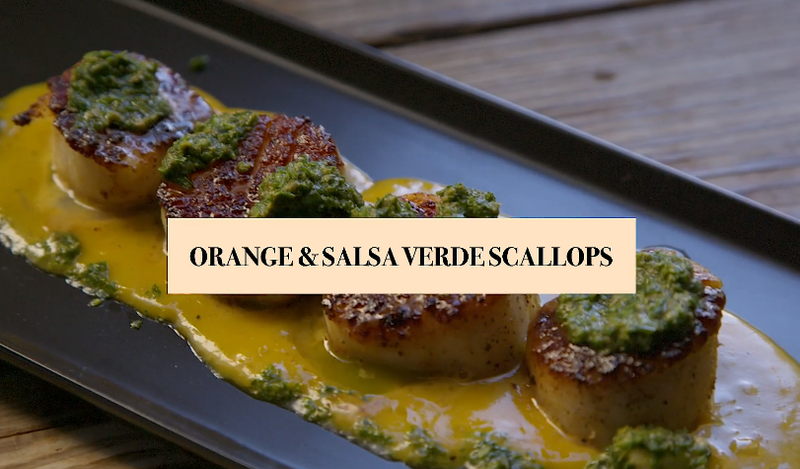 Serve Scallops with both sauces.